Estes Posts More "Coming Soon"
The above was posted on Estes' Facebook page today. Some folks got a little concerned when the Estes website seemed to be down a few hours ago, but it appears to have been only a hiccup which would have gone unnoticed if we weren't all a bit on edge recently. I want to refrain from too much public speculation about what the Hobbico bankruptcy might or might not mean for the future of Estes. But I will take the continuing announcement of new rockets as a positive sign and continue to hope for the best. Hobbico, the Champaign, IL company which owns Estes Industries (along with a large number of hobby outfitters), is filing for Chapter 11 bankruptcy, and layoffs may begin in April, according to an article on the Champaign News-Gazette website. Hobbico “has determined that it may be necessary in the near future to permanently close and discontinue all of its operations in connection with a bankruptcy case to be filed under chapter 11 of the United States Bankruptcy Code,” wrote human resources Director Howard Salazar in a letter dated Wednesday obtained by The News-Gazette. Chapter 11 bankruptcy does not necessarily mean going out of business, but it may mean that Hobbico will have to sell off what it can. 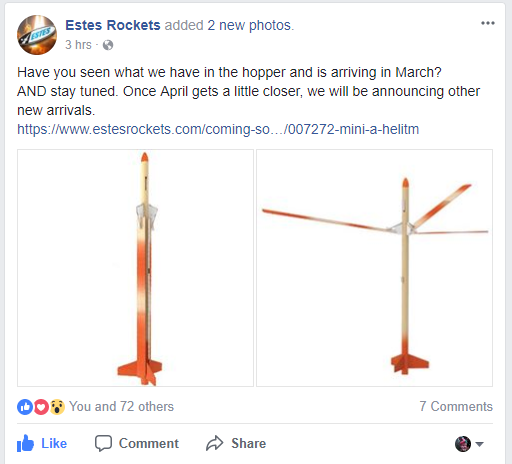 And though those of us in this hobby love Estes, in today's climate where this is rather an underground hobby, who will buy a model rocket company? Somebody, I hope! This is not the first time Estes has been up for auction. But nothing is guaranteed in this world. There are other model rocket companies, but as of right now there are no other low power model rocket motor manufacturers, and that's key. Estes isn't really in the model rocket kit business - it's in the model rocket motor business. The kits are what they make so we'll have something to burn motors in. That's how they make money, and it's why we need them. There are other model rocket kit companies, and you can always design your own and build from scratch. And, of course, there are AeroTech and Cesaroni composite motors - most of them mid and high power, but a few smaller ones. Once AeroTech/Quest come out with their line of Q-Jet composite motors, you'll have something low power to fly your standard 18mm model rocket kits on. But without small, easy-to-use black powder model rocket motors, I worry for the future of this hobby. BP motors are cheap, and simple enough for kids to use without too much fiddling. And you've got to keep getting kids into this hobby if you want it to remain strong and not die out. I'm usually pretty skeptical when I see people in online forums claiming the sky is falling after seeing a news article about something negative happening in model rocketry. Whenever there's an incident or accident, someone always claims that this is the end, folks. And it never has been so far. But guys, I just got into this thing a few years ago, and it means so much to me! So this is one news story which actually has me rather worried. Now, if you'll excuse me, I need to go check my PowerBall ticket, to see if I can afford to buy a model rocket company. Some footage by Joe Barnard.